Funds to repair the seawall are not to exceed $200,000 and staff will use polyurethane grouting system. AVALON — The city of Avalon received a trick instead of a treat the day before Halloween, as the aging seawall on South Beach finally gave way due to a storm surge, leaving a sinkhole. City council members held a special meeting Oct. 31 to discuss emergency repairs to the seawall not exceeding $200,000 in funds. Director of Public Works Bob Greenlaw, who stressed the importance of finding a long-term solution at a later time instead of patchworking the seawall together temporarily, urged the council members to approve a bid by EagleLIFT. Greenlaw asked for repair money to be dispersed through Harbor Reserve funds; council members green-lit the action unanimously. EagleLIFT, a foundation repair company with headquarters in Ontario, California, has worked on projects with Port of Los Angeles using a polyurethane chemical grouting technique. According to Greenlaw, EagleLIFT would inject the polyurethane foam into the sand, creating a hard foundation for the wall. Estimates for the cost of the grout and mobilization were approximately $48,500 with other elements of the project to be decided later. Workers drill holes into the sand and inject the grout to depths of up to 45 feet. The polyurethane grout is a nontoxic method that is safe for the ocean environment. Over the years high tides and other natural elements have damaged the seawall, which Greenlaw estimates to be at least 70 years old. During the meeting, it was revealed there is no rebar or additional support in the engineering of the wall. A storm on Oct. 15 had initially damaged the wall, and that’s when Greenlaw first noticed a weak spot and cracking. The wall eventually collapsed, due to stress. Greenlaw stated there had been previous attempts to repair the wall, but staff could not dig deep enough below the tide lines to access the areas that need to be fixed. 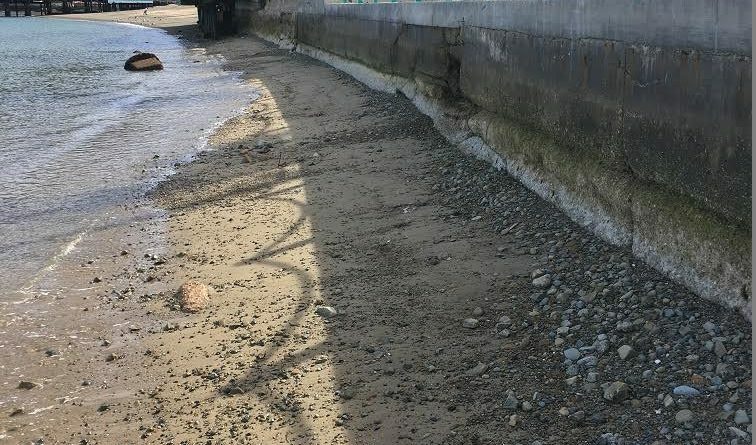 South Beach has lost sand recently, which also may have contributed to the disrepair of the seawall. The issue with the sand loss will also be addressed by city officials at a later time. Council member Pam Albers asked if the California Coastal Commission had been contacted, and Greenlaw stated he would make a phone call to them the following morning. The Log contacted Greenlaw for further comments, but he could not be reached by the publishing deadline. At the meeting, Greenlaw stated construction could begin as early as Nov. 3.